On December 7, 2016, the OIG released a policy statement (2016 Statement) regarding gifts of nominal value to Medicare and Medicaid beneficiaries.1 By way of background, the 2016 Statement updates an OIG Special Advisory Bulletin published in August 2002 (2002 Bulletin) related to offering gifts and other inducements to beneficiaries.2 The 2002 Bulletin discusses Section 1128A(a)(5) of the Social Security Act, which, in summary, provides that a person who offers or transfers to a Medicare or Medicaid beneficiary any remuneration that the person knows or should know is likely to induce the beneficiary’s selection of a particular provider of services or items payable under the Medicare or Medicaid program may be liable for civil money penalties. Remuneration is generally interpreted broadly in the context of health care fraud and abuse to include anything of value. In the 2002 Bulletin, the OIG noted that offering gifts to beneficiaries to influence their choice of a Medicare or Medicaid provider raises quality and cost concerns, may incentivize providers to offset the cost attributable to such gifts by providing unnecessary services, and that the use of such giveaways may favor large providers who have greater resources for such activities. As guidance for providers, the 2002 Bulletin permitted providers to offer Medicare or Medicaid beneficiaries inexpensive gifts or services without violating the statute. Specifically, for purposes of enforcement, the OIG defined inexpensive gifts as those with a retail value of no more than $10 individually and no more than $50 in the annual aggregate per patient. The OIG also noted that inexpensive gifts specifically excluded cash or cash equivalents. While the OIG had numerous opportunities to increase the dollar amounts over time, it made a conscious effort not to do so until the publication of the 2016 Statement. The 2016 Statement provides that, effective December 7, 2016, the OIG now interprets “nominal value” as having a retail value of no more than $15 per item or $75 in the aggregate per patient on an annual basis. From a customer standpoint, for those physical therapy private practices that elect to provide gifts such as T-shirts, coffee mugs, or other similar items to patients, this adjustment in the OIG’s interpretation of nominal value will likely have a direct effect on such customer programs. On December 7, 2016, the OIG released a Final Rule revising certain safe harbors under the anti-kickback statute and adding new safe harbors to protect providers who comply with the requirements (Final Rule).3 As background, the anti-kickback statute assigns criminal penalties for individuals or entities that knowingly and willfully offer, pay, solicit, or receive remuneration to induce or reward the referral of business reimbursed under certain federal health care programs. A “safe harbor” describes a specific payment or business practice that is not treated as a criminal violation under the anti-kickback statute even though it could possibly induce referrals of business under a federal health care program. 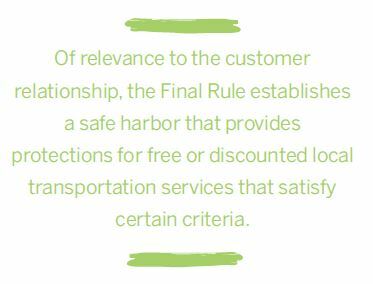 Of relevance to the customer relationship, the Final Rule establishes a safe harbor that provides protections for free or discounted local transportation services that satisfy certain criteria. Even prior to the Final Rule, free transportation has been an issue under consideration by the OIG for many years, including more recently through its publication of a Proposed Rule4 in 2014 and an Advisory Opinion5 in 2015. The safe harbor for local transportation published in the Final Rule provides that “remuneration” does not include free or discounted local transportation if a number of conditions are satisfied. Specifically, the availability of the free or discounted local transportation (i) must be set forth in a uniformly and consistently applied policy and not be determined in a manner related to the past or anticipated volume of federal health care business; (ii) must not be air, luxury, or ambulance level transportation; (iii) cannot be publically marketed or advertised and those arranging for the transportation and the drivers cannot be paid on a per beneficiary transported basis; (iv) can be made available only to established patients within 25 miles of the health care provider (or within 50 miles if the patient resides in a rural area) and must be for the purpose of obtaining medically necessary items and services; and (v) must have the costs of such transportation borne by the entity making the transportation available to the patients. While each of these specific elements is set forth in significant detail in the Final Rule, these elements clearly track the OIG’s historic position that a narrowly tailored transportation program may be permissible under the anti-kickback rule. The Final Rule goes the extra step of setting forth specific criteria to be considered when implementing such a program for patients and customers of private physical therapy practices and other health care providers. 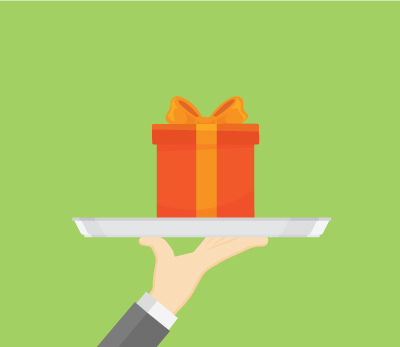 When considering the wide range of options available to private practice physical therapists seeking to foster positive customer relationships, the provision of gifts of nominal value and the offering of free transportation to patients and customers are often considered. The recent guidance published by the OIG and summarized here will better allow providers to analyze such customer initiatives and ensure they are implemented in a legally compliant manner. Please note that this article is not intended to, and does not, serve as legal advice to the reader but is for general information purposes only. 1. Office of Inspector General Policy Statement Regarding Gifts of Nominal Value To Medicare and Medicaid Beneficiaries, Department of Health and Human Services Office of Inspector General, December 7, 2016. Available at: https://oig.hhs.gov/fraud/docs/alertsandbulletins/OIG-Policy-Statement-Gifts-of-Nominal-Value.pdf. Accessed March 13, 2017. See also Footnote 3. 2. Offering Gifts and Other Inducements to Beneficiaries, Department of Health and Human Services Office of Inspector General, August 2002. Available at: https://oig.hhs.gov/fraud/docs/alertsandbulletins/SABGiftsandInducements.pdf. Accessed March 13, 2017. See also 65 FR 24400, 24411 (April 26, 2000). 3. Medicare and State Health Care Programs: Fraud and Abuse; Revisions to the Safe Harbors Under the Anti-Kickback Statute and Civil Monetary Penalty Rules Regarding Beneficiary Inducements. Department of Health and Human Services Office of Inspector General, December 7, 2016. Available at: www.federalregister.gov/documents/2016/12 /07/2016-28297/medicare-and-state-health-care-programs-fraud-and-abuse-revisions-to-the-safe-harbors-under-the. Accessed March 13, 2017. 4. Medicare and State Health Care Programs: Fraud and Abuse; Revisions to Safe Harbors Under the Anti-Kickback Statute, and Civil Monetary Penalty Rules Regarding Beneficiary Inducements and Gainsharing. Department of Health and Human Services Office of Inspector General, October 3, 2014. Available at: www.federalregister.gov/documents/2014/10/03/2014-23182/medicare-and-state-health-care-programs-fraud-and-abuse-revisions-to-safe-harbors-under-the. Accessed March 13, 2017. 5. OIG Advisory Opinion No. 15-13. Department of Health and Human Services Office of Inspector General, October 14, 2015. Available at: https://oig.hhs.gov/fraud/docs/advisoryopinions/2015/AdvOpn15-13.pdf. Accessed March 13, 2017. Paul J. Welk, PT, JD, is a Private Practice Section member and an attorney with Tucker Arensberg where he frequently advises physical therapy private practices in the areas of corporate and health care law. He can be reached at pwelk@tuckerlaw.com.